This may be the first and only time I will ever be quoted in a delivery ad. All the more so because the film is actually reviewed by The New York Times by Nathan Lee (no relation, as far as I am aware, to me). I wrote both a newspaper article and a blog post about the film, which is not a documentary but a fictional film. The differences between the two are instructive in how blogging differs from deadtree reporting. The directors of â€œTake Out,â€ a feature film about a Chinese deliveryman who must pay off his debt to immigrant-smugglers, do not claim that their movie is based on a true story. But it has more than a passing resemblance to a documentary, so much so that after a screening, one of the audience members asked where the man was now, and whether he was doing all right. 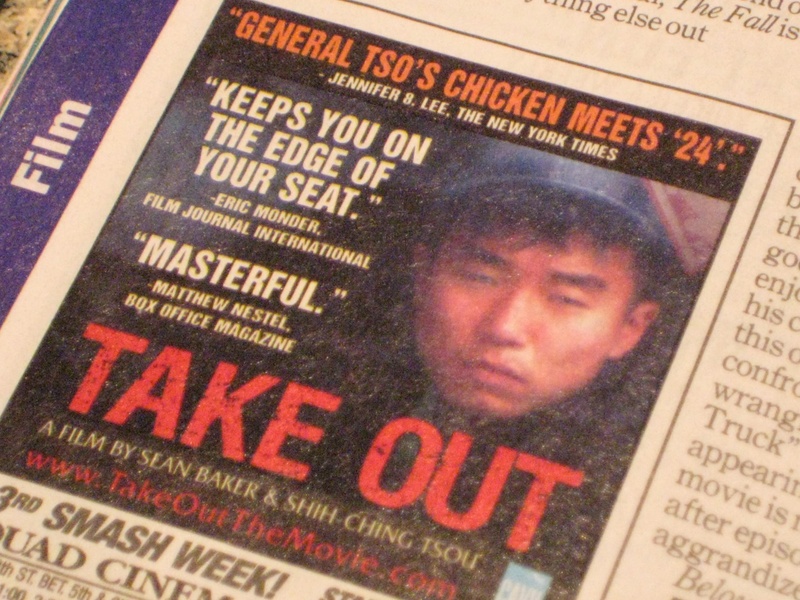 The new film â€œTake Out,â€ about a Chinese deliveryman struggling to pay off his debt, is not a documentary. Really. Even though its gritty style makes it look like one. After a screening, after the credits rolled, one audience member even asked: Where was the deliveryman now, and was he doing O.K.? In fact, the man on screen is doing fine. He is a Korean-American actor named Charles Jang who learned to speak fluent Mandarin from a year of study in Taiwan. The film is startlingly realistic as so much of it filmed in real places. (That’s what happens when you have a $3,500 budget). Indy films are really hard to get out there. The fact it’s in distribution at all is impressive. Here is the film’s theater box office receipts from Box Office Mojo. It brought in $10,505 in its opening weekend, which made it 72 nationwide. That’s about 1,000 people who saw the film, which actually, given its subject matter and a single screen isn’t bad. It dropped by half in its second weekend, but then expanded to three screens and was back up by weekend three. Cross fingers.